Flanked by two of her creations in her late father’s workshop, Lisa Kier works on another autumn creation. For years, Lisa Kier worked at a job she enjoyed with people she liked, but in the back of her mind she always wondered what it would be like to follow her dream and open her own business. Around the beginning of August, she decided to take the plunge, and now she says she could not be more happy. Kier’s business does not yet have a name, but she makes primitive woodworks of all sorts. So far, she said, it has worked out better than she expected. “I didn’t know if I could do it, but I proved myself wrong,” she said. Currently, she’s swamped creating autumn-related items and is already receiving orders for Christmas creations. Primarily, Kier takes requests for her art through Facebook, and she mostly creates items from special orders. Things started changing for Kier when her father, Teddy Moore, passed away in June of last year. She eventually moved into the home where her father had lived and where she grew up. Her grandchildren and their parents moved in, and she decided to take care of her grandchildren while their parents work. So, after she takes care of her grandchildren during the day, in the evening she heads to her father’s old workshop, which she has transformed into a work space of her own. Her father’s trophies and mementos still line its walls. “He was always out here in the shop tinkering around on stuff, and he always said, ‘I wish I had more room out here so you could do your stuff.’ Now that he’s passed away, here I am,” the 40-year-old Kier said. Before opening her own business, she worked for nearly 11 years at Peebles Department Store, where she was assistant manager. She said she thought highly of the people with whom she worked, but is happy she decided to follow her dream. If she has time between customer orders, she said, she concocts ideas for new products, creates them, and posts them online for sale. She said she has only had to turn one or two orders away, and that her type of creations can sometimes be expensive. So she tries to keep her prices low while still making a profit. 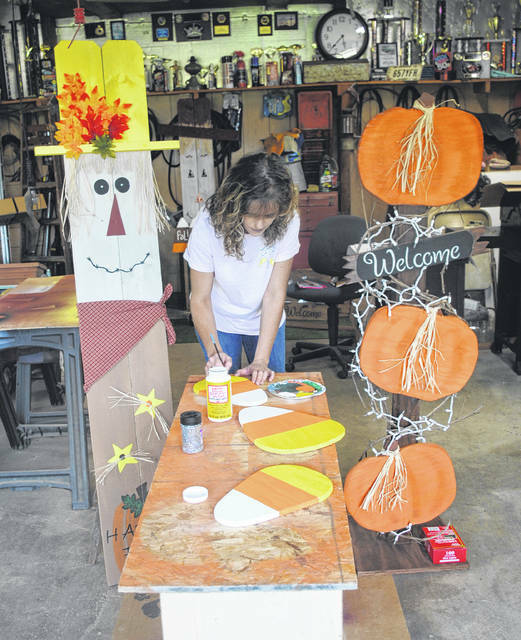 https://www.timesgazette.com/wp-content/uploads/sites/33/2018/10/web1_Lisa-Kier-pic.jpgFlanked by two of her creations in her late father’s workshop, Lisa Kier works on another autumn creation.